The objective of the Latin American Drought Monitor is to provide an assessment tool of current and expected drought and flood conditions for the Region. The Monitor is built in collaboration with the Terrestrial Hydrology Group at Princeton University and the International Centre for Integrated Water Resources Management (ICIWaRM), and uses the same setup as the US Drought Monitor and the African Drought Monitor. The portal holds information on current meteorological information (Precipitation, Temperature, Radiation and Wind Speed), as well as drought indicators (SPI, Soil Moisture, NDVI) and flood indicators (Surface Runoff and Streamflow). This information can be obtained either spatially or for point locations, and for specific dates, months or annual timescales, and is compared with the normally expected conditions or percentiles. The Drought and Floods Monitor also hosts forecast capabilities on the short term and on the longer seasonal timescales. To access the portal click here. To access the tutorial click here. 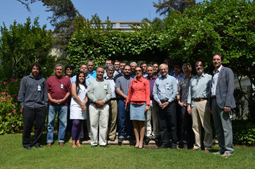 A first workshop was organized on 17 and 18 November 2014 to train the Water Authorities in Latin American and Caribbean on the use of the Drought and Floods Monitor during 2014. A roadmap was developed to identify the steps towards further improvements of the system.